Communities Minister Andrew Stunell meets graduates from the Black, Asian and Minority Ethnic Women Councillor Mentoring Scheme. Andrew Stunell met with over 60 women from black and minority ethnic backgrounds yesterday, after they graduated from the ground-breaking mentoring scheme. The scheme aims to encourage more people from diverse backgrounds to engage with their council. Fifteen of the women were so inspired that they stood for election in the 6 May poll, 4 of them winning seats. The minister spoke alongside Lynne Featherstone, Equalities Minister. Good representation is the key to making public institutions responsive to the needs of the people they serve. The Big Society and Localism are both about inclusiveness and fairness, giving huge potential for women and ethnic minorities to influence decisions. The more we give power back to local bodies, the more important this gets. Congratulations to all of the women who took part in the scheme. I’m looking forward to working with partners and Ministerial colleagues across government to push the race equality agenda forward and improve opportunities for people of all backgrounds. 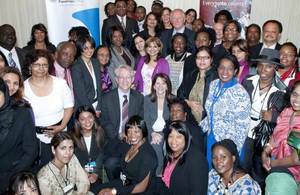 The scheme paired Black, Asian and Minority Ethnic women with local councillors over a 6 month period, from October 2009 to March 2010 and gave participants first hand knowledge of the roles and responsibilities of councillors, serving officers and an insight into systems and procedures. The aim was that upon completion, the leadership programme would equip and motivate participants to engage in party politics. The scheme gave me a fantastic insight into the life of a councillor and really opened doors for me. This is an excellent, well-run scheme, which gives people a really good taste of public life. I’m now a councillor and it gave me the push I needed to stand for election. The scheme gave me a fantastic insight into the life of a councillor and really opened doors for me. The opportunities to network and make contacts that it provided are so important. I stood for councillor this year and have high ambitions! I would recommend this scheme to anyone. The event took place in the House of Commons yesterday (Monday 14 June). The scheme was launched last year by the Government Equalities Office and Operation Black Vote. (Photograph above courtesy of Operation Black Vote).